It’s definitely Autumn. As I sit at my computer I can hear the rumble and whirr of the combined maize harvester driving along the paddock adjacent to our property. 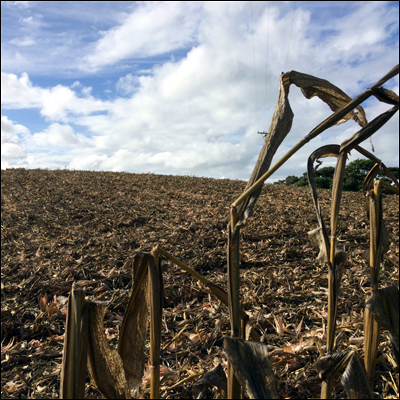 As it moves down the rows, capturing everything in its path and discarding all but the individual maize kernels, great clouds of dust rise around it. The wind has picked up this afternoon and is blowing in from the north… It was supposed to rain, and perhaps it still will, but right now it’s a mixture of bright sunlight and racing clouds. This beautiful squash, ‘Burgess Buttercup’ weighed 3.189 kg. It’s the time of year for clean-up and maintenance tasks in the garden. The squash and pumpkins are ready to be cut from their vines and stored in a dry and airy place. The twisted brown tomato stalks need to be pulled out and burned, along with the remains of our former passion fruit vine. I made the decision to remove the vine after it had finished cropping, due to it being afflicted with disease. It has been incredibly productive this year, and I’m sure we have eaten more than 200 individual passion fruit. So, it was with a heavy heart that I cut it away from the fence yesterday. All that is left is to dig the roots out of the soil. A scattering of fruit; Feijoa and Guava. 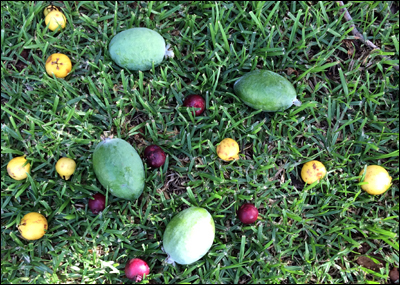 Plump feijoa and red and yellow guava are strewn on the grass outside our kitchen window; an array of yellow, green and red baubles. While the guava are quite definitely edible, now that the feijoa are ready they won’t get a look in with me. Back in Spring when the blackbirds were stripping the petals from the flowers, I could not have imagined that the trees would be so heavily-laden. 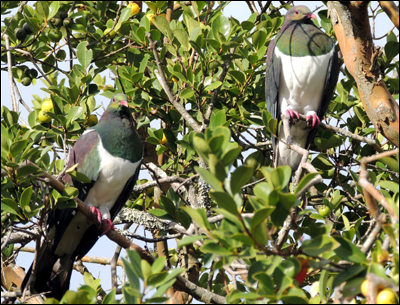 A pair of kereru in the yellow guava. For several days we’ve had two plump kereru camped out in the fruit trees. At night they seem to seek refuge in the golden totara, but by day they stay in the yellow guava, gorging on the fruit (they can swallow the guava whole!) or just sitting still in the sun. 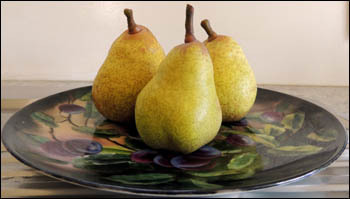 We’ve also had many pears. The only problem is getting to them before the blackbirds! But if we go out early in the day we can usually rescue most of them. 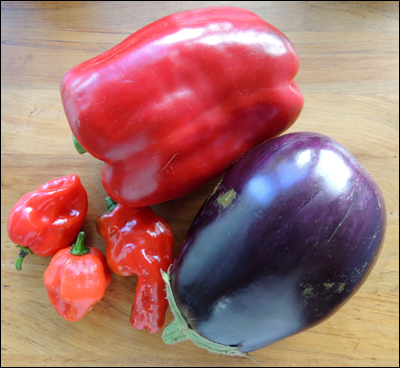 For the first time, we’ve had eggplants that have grown to maturity and we’ve had an amazing crop of capsicum. I’m hoping that these will keep cropping until May or June. We also have abundant habanero and one other (unidentified) chilli pepper. This latter plant came from a packet of chilli ‘Caribbean Blend’ so I’m not really sure what it is. We sampled it (with trepidation), and although it was hot, it didn’t seem as hot as a habanero, nor did it have the beautiful floral flavour that a habanero has. Our new seasons’ chilli peppers strung up in the barn. As you can see from the photo above, I’m going to dry the chillies this year. We have such a huge chest freezer, that even with the baskets at the top, we tend to lose track of small things. It will be interesting to see if I’m successful or not. I thought it would be great to grind them up and use them with a pepper shaker. 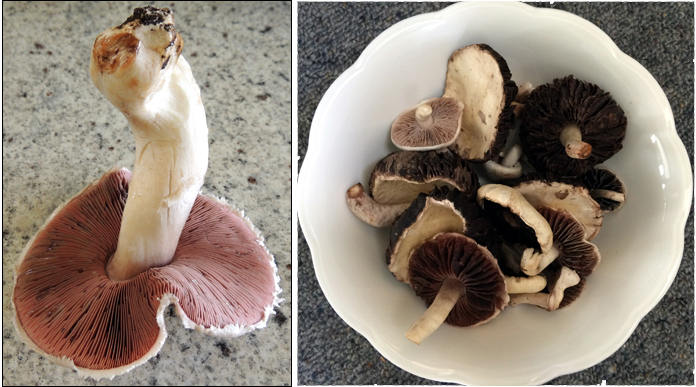 This morning I took a bucket to the farm across the road and collected some field mushrooms. Yum!!! These are my favourite funghi. They have such a rich taste in comparison with button mushrooms purchased from the supermarket. Field mushrooms, freshly-picked this morning. They’ll be great sauteed in butter and stirred through some freshly made pasta. What’s left after the harvester has done its job. The harvester has finished in the field. All that is left behind are the husks and a few dried leaves. It’ll be tough for the small shrubs we have on the fence-line, especially now that the wind is coming from the north. For a good six months they’ve been sheltered by the maize! 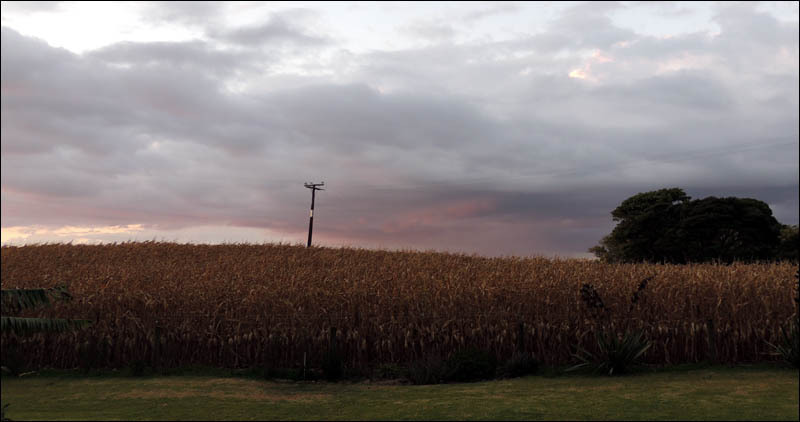 The maize field is now stark against the sky. View to the north as the sun was setting last night. We harvested most of our squash during the past week. It was a very good crop and I’m pleased with the varieties we chose to raise from seed this year. Squash ‘Butternut Chieftain’ and ‘Burgess Buttercup’, with ‘Thelma Saunders Sweet Potato’ in the foreground. Even though I’ve tended to grow the larger pumpkins in the past, the beauty of the smaller varieties is that you can cut into one and don’t end up with a huge vegetable to eat or process in a short amount of time. 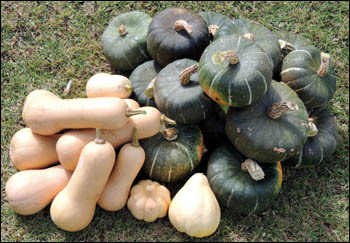 The butternut and buttercup squashes are ideal for a family of two. 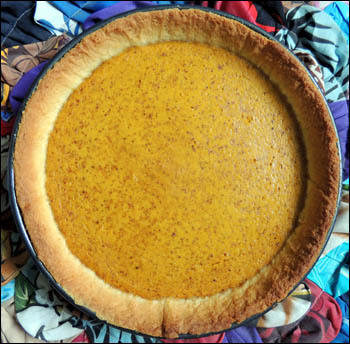 Keeping with the theme, I baked a pumpkin pie on Sunday, using some frozen mashed pumpkin from last year’s crop. 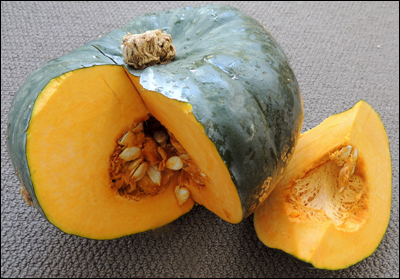 This was from a Crown pumpkin – a large variety with smooth, pale grey skin and sweet orange flesh. Despite being frozen for all this time, the puree tasted very good. A healthy serving of pumpkin pie. The filling is comprised of pureed pumpkin, evaporated milk, eggs, ground ginger, ground allspice and caster sugar. The base is formed using sweet shortcrust pasty, which I baked blind before adding the filling. The pie is topped with freshly-grated nutmeg. I’m interested in experimenting with tofu to see if I can make a vegan version. 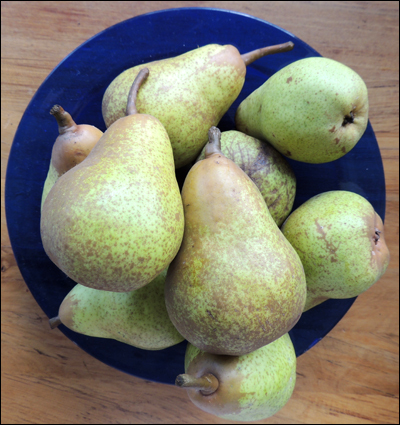 Pears are falling daily from the old pear tree. You may recall that back at the beginning of January, I started a Rum Pot using strawberries, plums and some cape gooseberries. With the pears ripening and dropping each day, I decided to add some in. The fruit that has been macerating in the rum and sugar for the past couple of months, smelt extremely enticing. I couldn’t resist tasting some of the liquor – it was very heady and almost spicy, reminding me of Christmas. So, now the rum pots have pieces of pear in them as well! 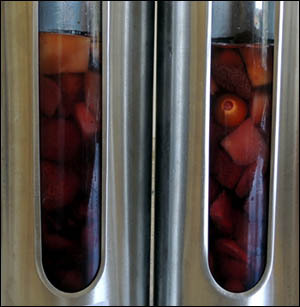 A view of the fruit macerating in the rum pots. The next fruit to ripen should be our feijoa. I must admit that I’m not exactly sure how well the feijoa will enhance the mix, but we’ll see! As much as I love fresh feijoa, they do sometimes have something of a chalky texture. On Wednesday (05 March) I sowed seeds of the following Brassica – Broccoli ‘Premium Green’, Cabbage ‘Scarlet O’Hara’ and Cauliflower ‘All the Year Round’. Brassica don’t seem to do so well in our hot, dry summers, but we have had good results during Winter and Spring. I’m hoping that these will be ready to plant out in a month or so’s time. The broccoli and cauliflower have sprouted already (5 days). The ‘swans’ on our swan plants (Asclepias physocarpa) are bursting with fluffy seeds. We appear have the full cycle happening at once – tiny caterpillars, fat caterpillars, cocoons, adult butterflies, mating butterflies, flowers and seed pods. The grass in some areas of the garden is carpeted with the ‘down’ from the seeds. I suspect we may have something of a swan plant problem in 2014/2015. But at the moment I can’t see that we’d ever have too much of them. I love having the butterflies always present in the garden. Close up of swan plant beetle, and view of bursting seed pod. When I was photographing the seed pods and their bursting seeds, I noticed a small insect inside. I have since identified this as Arocatus rusticus, a native of Australia that has become established in New Zealand. 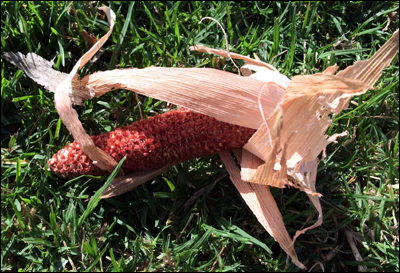 Despite the foliage and sap of the swan plant being toxic to plant-eating creatures, it seems that Arocatus rusticus has evolved the ability to overcome the toxin and store it in its own body. You can’t really tell from my photo, but the insect is orange/red and brown in colour. This is to warn off predators as the toxins stored in its body has made it toxic, too. Lottie does like to boss the Orpingtons around. 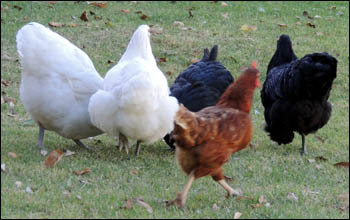 The four new Orpington hens have settled well alongside our three Red Shavers. Lottie is the boss of all seven, and every so often has to assert her dominance, usually by pushing in on a choice item of food, or by chasing one of the stragglers. They all choose to sleep in the same hen house nowadays, often trying to squeeze onto the same perch! Francesca, Pearl, Fatima and Hannah (the four Orpingtons) mostly stick together and if Lottie isn’t around, Leila and Lulu will often be found nearby. 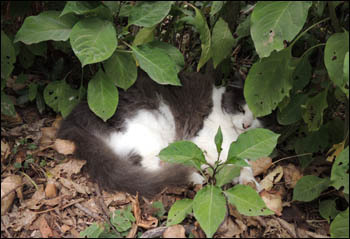 Their favourite spot on these hot Autumn days is to sleep and dust bathe under the shade of the Feijoa trees. When the Black Orpingtons were little, they looked so cute running around. From a distance they looked like they were wearing burqa – hence the name Fatima. 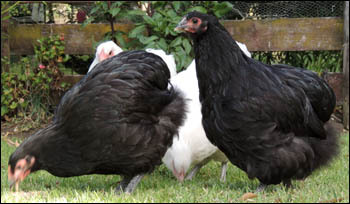 We named the other Black Orpington, Hannah, to maintain balance. The Red Shavers are very naughty. Lottie has taken to ‘disappearing’ in the mornings and not returning until sometime in the afternoon. One day I spotted her hurrying across the road and into the trees on the other side. We think that perhaps the house down the road may have something interesting to attract her – a rooster, maybe, but we’re not sure. I’ve taken to not letting the hens out until after 10.00 am or so, to be sure they have laid all their eggs before one of them heads off further afield. Yesterday Leila caught a small field-mouse which must have strayed from the maize field. Poor wee thing – all three red hens set upon it – it didn’t have a chance. Molly often watches the hens from a secluded spot. Molly and the hens have developed a ‘kind’ of respect for each other. But to me it seems like the only advantage Molly has, is that she is allowed inside the house and the hens aren’t. Sometimes they look through the living room window at Molly, looking out. I’ve seen them peck at her if she comes too close to them, but I’m sure she could defend herself if she had to. When I go into the hen’s enclosed area in the morning to collect their eggs, Molly always accompanies me. She has a good look around their area when they aren’t there. I find this amusing.